I’ve since realised that whilst these toys sure did capture the attention of my daughter, they were not the best choice for encouraging some of life’s most fundamental skills such as problem solving and persistence. Furthermore, the singular and closed functions of this type of toy left little room for my daughter’s imagination to blossom or her creativity to grow. 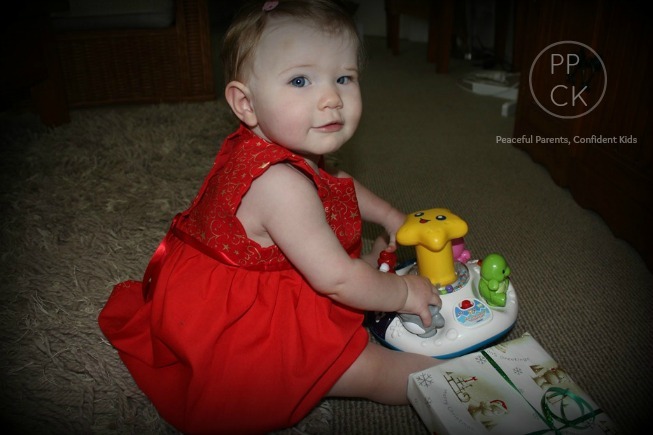 Two years on and I have found that my eldest daughter, who was exposed to many more of these push button, light up toys than my second child, has a much lower attention span and whilst highly intelligent with phenomenal recollection, her ability to persevere with a task and problem solve does not seem as developed as my younger child. She doesn’t seem to have the same investigative skills as her younger sister who was given significantly more open-ended toys to play with. Blocks are popular amongst children of all ages. There endless versatility puts them at the top of my list of open-ended toys. Children can use them to build zoos, train stations, cities or any other number of structures. It’s funny though because my children don’t use blocks to build structures, that just doesn’t seem to be their thing, rather, Lucy (2) will stack a couple together and then hand them around to Mum, Dad, sister and teddies as pieces of cake. Penny (nearly 1) explores the textures in her mouth and then crawls around the house with a block in hand sliding it along the floor like you would push a toy car. So straight away, it is clear that imagination is being fostered. We love these Melissa & Doug 60-Piece Standard Unit Blocks from Amazon combined with JR Rainbow Block 40 Piece Set for a splash of fun and colour (Affiliate links). It is always exciting when a new boxed item arrives at the house. 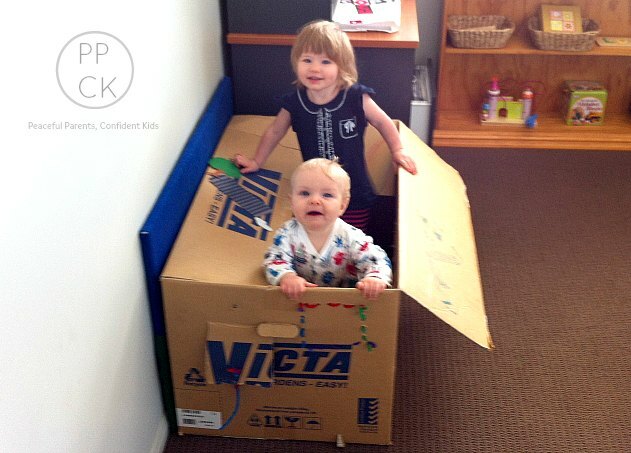 The kids are never interested in what’s inside – that’s for Mum and Dad- they just want the box. Lucy takes her dolls and teddys into the box for a picnic whilst Penny crawls in and out marvelling in the change in sounds and light. Both girls also love opening and closing the door and playing peek a boo or knock knock with each other. More recently Lucy has started climbing on top of the box and sliding down it as it collapses on the open ended side. You can get material in so many wonderful patterns and textures these days and my girls love getting into my material box, pulling out a piece (or 10) and using them in so many different ways. Lucy will wrap her dolls or teddies in a piece or use a bit as a picnic rug or run watching it as it trails behind her in the wind. Penny’s favourite thing to do is to put a piece over her head and then pull it down suddenly for peek a boo or she likes slinging it over her shoulder as she stands at the couch and then watching it as it falls into a heap when she drops it on the floor before picking it up and repeating over and over. If you don’t have scraps of fabric lying around, you can pick up cheap off-cuts from your local haberdashery store or you can purchase these exquisite plays silks from Amazon Simply Sweet Fabric 35″ Hemmed Square Play Scarves Bundle of 6 (Affiliate Link) . For those of you who dabble in sewing, these sewn squares are brilliant. Kate from An Everyday Story has a link to show how to make them and they are really simple. 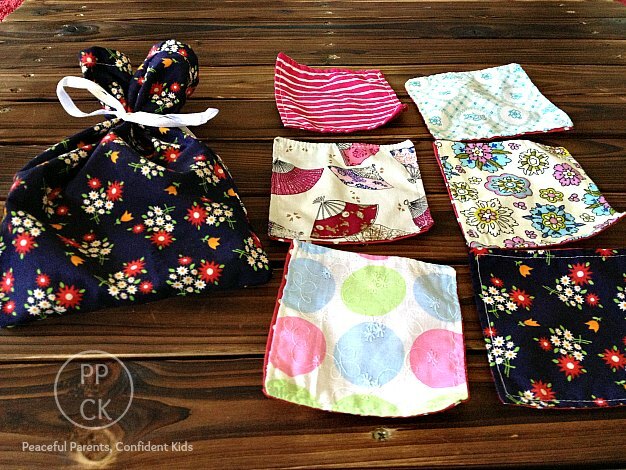 Lucy uses them as sandwich fillers, baby blankets, ice skates on the tiles, hats and many more things. Penny loves rubbing them between her fingers before stuffing them back in their little bag and pulling them out again to repeat. She also loves crawling around the floor, pushing them along the tiles similar to the blocks ( should give her a scrubbing brush next – haha!). My Children love to explore my kitchen cupboards. I have the unsafe ones safely locked up and allow the girls access to the non-breakable items. 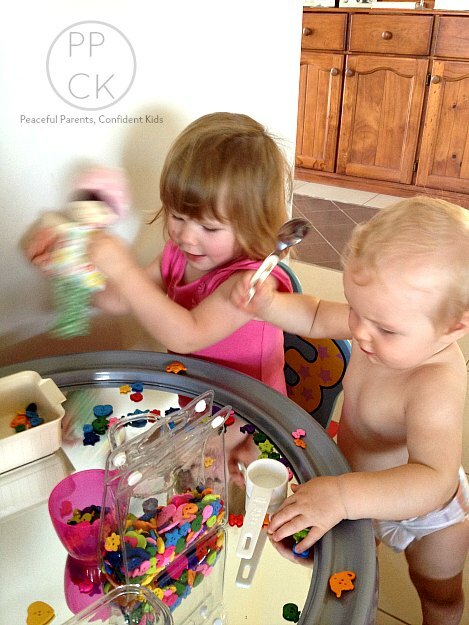 Often, I will simply give them a stainless steel colander and a spoon or a cup and let their imaginations go wild. As Penny mouths the cool texture of the steel and then places the cup in and out of the colander, Lucy will wear the colander as a hat or stick the spoon handle through the holes. There are so many wonderful ways a child can play with kitchenware. If more parents realised this, toy stores would go broke!! 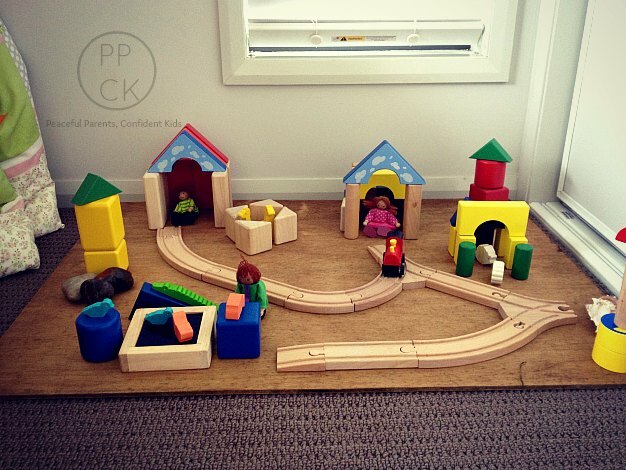 Simple open-ended toys like these will actively spark children’s imaginations and allow for more engaging playtime and for those of you who would like more inspiration for open ended toys, Kate from An Everyday Story has a lovely blog showcasing her wonderful Reggio and Montessori inspired play room. So whilst my children argue against my selection of toys to go on the ‘leaving’ pile, I am happy in the knowledge that the toys which remain will form the foundation for them developing higher order thinking skills, imagination and creativity as they mature. 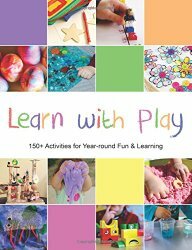 Featuring over 150+ activities for babies, toddlers and preschoolers, the Learn With Play book is now available for purchase on kindle or in print. Click here to purchase *.